The actor wants a sibling for his son, Little Spring Chicken. 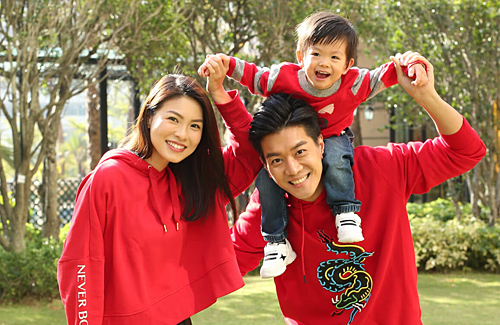 Married to former Miss Hong Kong participant Nicole Li (李潔瑩) since 2014, Lai Lok Yi (黎諾懿) has been generously sharing updates of their son, Little Spring Chicken (小春雞). Last year, Little Spring Chicken was hospitalized due to wheezing and had to miss the joyous festive celebrations. Lok Yi said, “This is his first year celebrating the new year. Due to a virus attacking his throat last year, it affected his breathing with the risk of suffocation. At the hospital, he had to receive oxygen therapy; my wife and I had to hold down his body so he would take in the oxygen. They had to draw blood from him too, which made us feel sad.” Any thoughts of celebrating Lunar New Year were at the back of their minds, as the couple had exhausted themselves by taking turns through the night to take care of their son and focused more on his speedy recovery. Sharing about his parenting journey, Lok Yi says taking care of their very active son has been tough on Nicole and him. “It’s hardest at his stage now, as he is more mature than babies his age and knows what he wants. Babies at their stage need a lot of attention; even keeping up with him is tiring. When we go out for a meal, we just fill our tummies rather than really tasting the food as we’re too busy keeping an eye on him,” laughs the actor. Although raising a child is not an easy feat, Lok Yi hopes to have a second baby soon. He said humorously, “Since its tiring (to raise a child), I thought why not get the hard work done at the same time! Although my back is hurting, many say that the weaker a man’s constitution, the more acidic his body is and the higher the chances of conceiving a girl. So I don’t need to especially strengthen my body with tonics; hopefully I can have a baby girl in the Year of the Pig!” He added, “I think psychological pressure affects the outcome, so I’ll keep it cool as to whether we can ‘make it’ in time. “Although I keep saying I want to have a girl, I will be just as happy with a boy. My wife and I have agreed that our son should have a companion, so that one day when we’re no longer here, he will not be lonely as there’ll be someone to share his troubles with.” The actor also shared that they will not be planning on a third baby, despite the gender of their second child.